My academic trajectory began in 1964 as an undergraduate studying English Language and Literature at the University of Durham (in the UK) where, through a course on Anglo-Saxon Antiquities, I was introduced to sculpture of the eighth century. I then went on to study for a Diploma in Art History at the University of Edinburgh where, moving four centuries later, I started research on twelfth-century illustrated Saints’ Lives. (Notwithstanding my failure at both Latin and Art History while at school, the eventual outcome of this was a long article on “Medieval Illustrations of Bede’s Life of St Cuthbert” published in the Journal of the Warburg and Courtauld Institutes in 1978.) In 1969 I was appointed Assistant Keeper in the Department of Art and Archaeology in the Royal Scottish Museum (now the National Museum of Scotland) where my curatorial responsibilities included arms and armour, eighteenth-century silver and a collection of late Gothic German and Netherlandish wood sculpture. A growing interest in German wood sculpture – prompted in part by an afternoon in 1974 spent with Michael Baxandall – developed into a wider concern with sculpture from the medieval period to the nineteenth century and an involvement in the 1978 Giambologna exhibition shown in Edinburgh, London and Vienna. In 1980 I moved to the Department of Sculpture at the Victoria and Albert Museum with responsibility for sculpture between 1400 and 1900 north of the Alps. Though still engaged with late Gothic German sculpture, my focus was increasingly on eighteenth-century sculpture, especially (but far from exclusively) British. I also worked on the history of the V&A’s plaster cast collection, which remains a continuing interest, along with the history of museums more broadly. Much (but not all) of my research over the past forty years has been on the history of sculpture – a select list of my publications is shown here and a full list is given on my CV – and this work was supported by research fellowships from the Leverhulme Trust and the Yale Center for British Art. 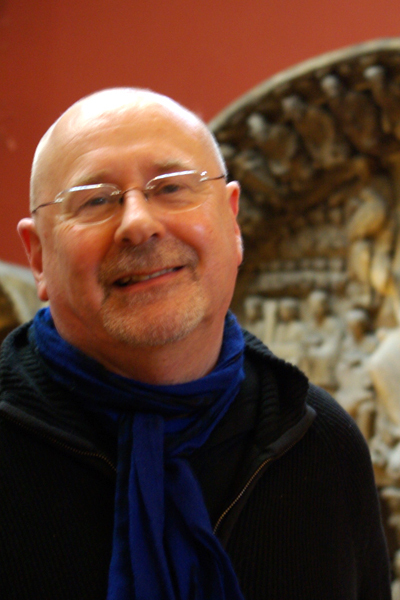 Apart from two stimulating years between 1990 and 1992 at the University of York, I remained at the V&A until my retirement in 2005, moving from Sculpture to the new Research Department and finally heading the team shaping the Medieval and Renaissance galleries. Effectively forming a whole wing of the museum, this is the curatorial achievement of which I am most proud. As I approached retirement in London, I looked towards the west coast of the US (where I had spent a year as a fellow at the Getty Research Institute) for a new career. Having in 2004 belatedly gained a PhD from the University of Edinburgh (some eight years after my book on Roubiliac co-authored with David Bindman had won the Mitchell Prize for Art History) I became a Professor in the Art History Department at USC of which I was Chair for two years. In 2007 I moved to UCR where I have remained, apart from leaves to take fellowships from the Huntington Library, the National Endowment for the Humanities and the Paul Mellon Centre. I shall be retiring (again) in June 2019. At the heart of my research is a fascination with how sculpture was made and viewed and the roles which it played within different societal contexts. Entwined here are various questions about materiality, the re-working of genres, reception and viewing and modes of perception as they relate to a category of artistic production that has often been seen as marginal. In a modest way, I have attempted to write sculpture back into the history of art. My most recent work has been on the portrait bust and the statue as genres and the way in which these became central modes of representation in eighteenth-century Britain, their development being linked with Enlightenment notions of perception and the self. Some of the questions involved here are addressed in my 420 page book published at the end of 2014 by Yale University Press: The Marble Index. Roubiliac and Eighteenth-Century Sculptural Portraiture. Although there are many books about painted portraits in this period, this is the first wide-ranging study of the sculptural portrait. In the first part I discuss the bust and statue as genres, looking at the emergence of the portrait bust and statue, the way in which they functioned as representations, their conventions, their settings and viewing conditions and the processes of commissioning, making, and replication. The second part consists of a series of case studies in which I discuss sculptural portraits representing some of the key figures of the British Enlightenment, including Newton, Pope, Handel, and David Garrick. The Marble Index built on my earlier books on eighteenth-century sculpture: Figured in Marble: The Making and Viewing of Eighteenth-Century Sculpture (2000) and Roubiliac and the Eighteenth-Century Monument. Sculpture as Theatre (1995), co-authored with David Bindman. But out of The Marble Index another line of enquiry has developed. This concerns the development of the author portrait during the “long eighteenth century”, the period in which notions of authorship were being re-configured and the idea of the modern independent author emerged. One outcome of this was an exhibition about portraits of Alexander Pope shown at the Yale Center for British Art and (in the UK) the Rothschild Foundation and the book which accompanied this: Fame and Friendship; Pope, Roubiliac and the Portrait Bust (2014). The digital scanning of the eight versions of Pope’s busts will form the basis of a collaborative publication with computer scientists at Yale while a fuller study of the author portrait in all media is my major current project. Other projects in progress include an article about Mattys Pool’s Art’s Cabinet and the ambiguity of the early eighteenth-century art book, and an online catalog of the monuments, busts and statues of Louis François Roubiliac. “‘For Pembroke, Statues, Dirty Gods and Coins’: The Collecting, Display and Uses of Sculpture at Wilton House”, in Eike Schmidt and Nicholas Penny eds., Collecting Sculpture in Early Modern Europe, National Gallery of Art, Washington, Studies in the History of Art, 2008, 378-395. “William Beckford’s Silver”, Burlington Magazine, 122 (1980), 734-48 and 82-34 (written jointly with Michael Snodin). Providing the first thorough study of sculptural portraiture in 18th-century Britain, this important book challenges both the idea that portrait necessarily implies painting and the assumption that Enlightenment thought is manifest chiefly in French art. 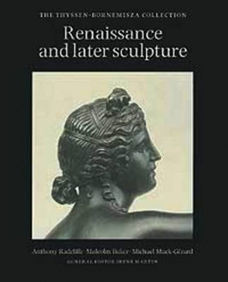 By considering the bust and the statue as genres, Malcolm Baker, a leading sculpture scholar, addresses the question of how these seemingly traditional images developed into ambitious forms of representation within a culture in which many core concepts of modernity were being formed. The leading sculptor at this time in Britain was Louis Francois Roubiliac (1702–1762), and his portraits of major figures of the day, including Alexander Pope, Isaac Newton, and George Frederic Handel, are examined here in detail. Remarkable for their technical virtuosity and visual power, these images show how sculpture was increasingly being made for close and attentive viewing. 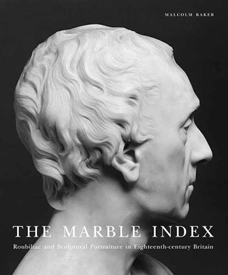 The Marble Index eloquently establishes that the heightened aesthetic ambition of the sculptural portrait was intimately linked with the way in which it could engage viewers familiar with Enlightenment notions of perception and selfhood. No literary figure of the 18th-century was more esteemed than the poet Alexander Pope, and his sculpted portraits exemplify the celebration of literary fame at a period when authorship was being newly conceived and the portrait bust was enjoying new popularity. 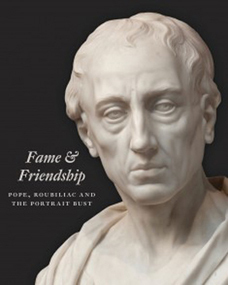 Accompanying an exhibition at Waddesdon Manor (The Rothschild Collection), this publication explores the convergence between authorship, portraiture, and the sculpted image in particular, by bringing together a wide range of works that foreground Pope’s celebrity status. This work is a study of 18th-century British sculpture, illustrated with sculptures from both the V&A and the J. Paul Getty Museum and also many impressive pieces from private collections and churches. The book starts suggesting new ways of looking at 18th-century sculpture and exploring its relationship to themes that have figured prominently in recent discussions on British painting. The relationship between painting and sculpture, and the links between making and viewing, are themes that are explored throughout the book. The chapters are arranged in five sections, each prefaced by a brief introduction, forming groups of case studies which illustrate approaches to: writing sculptural histories; design, making and materials; categories and genres; and finally, settings, collecting and display. Louis François Roubiliac, the most compelling sculptor in eighteenth-century Britain, was responsible for many complex and dramatic monuments that can be seen in Westminster Abbey and churches throughout the country. This book is not only the first extended treatment of the artist since 1928 but is also an exploration of tomb sculpture in the context of the period.